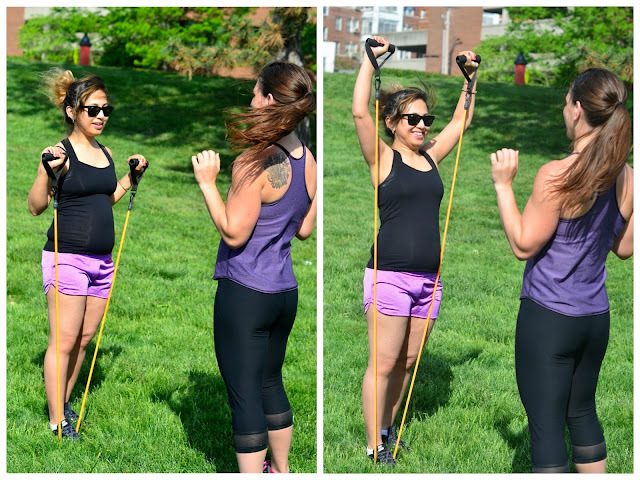 A few weeks ago I met up with Ritz from Journospeak In a Kansas City Park to help her out with a strong summer arms workout she could do at home while her daughter was playing. After our workout she helped me out with some quick makeup tips for looking good in pics and when you have very little time to go from workout to going out. Check out all the help I got over on Journospeak. The tip I found most useful is that when you wear makeup with SPF in it, it will reflect light. So if a flash is used for a picture you will look ghost white. I had never thought about that but it explains a lot of my super white face in pics. PushUps: 1 arms our wide, move hands under shoulder do 1 more. Repeat 6Xs for 12 pushups. Grab your resistance band. 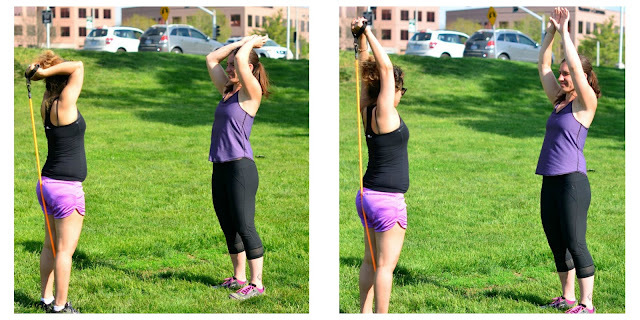 Shoulder Press Ups: Stand on middle of band and with palms facing out press straight up over head. Repeat 12-15Xs. 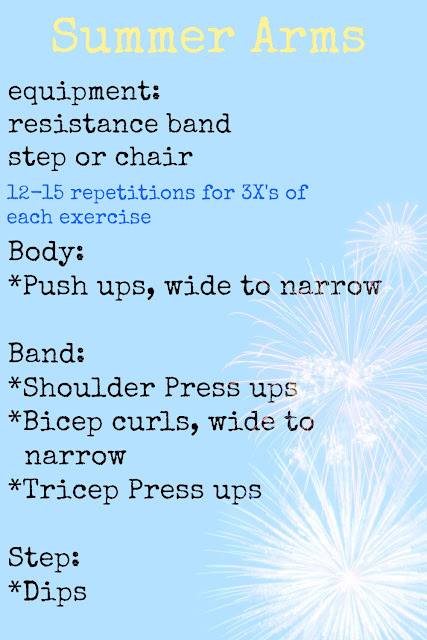 Bicep Curls: Standing on band, palms facing out, arms out wide and curl up. Bring arms back down and bring hands close together then curl back up and down. Repeat 12-15Xs. Tricep Press: Stand on one end of band and hold other end of band with both hands behind your head. Make sure your elbows are pointed forward and not out to the sides. Press up 12-15X's. Dips: Find a step, chair or anything you can dip yourself from. Hands on step, elbows pointed back and bottom just off the step dip down and up 12Xs. Repeat the whole workout for a total of 3 rounds to strengthen your summer arms then keep it up all year round because you should have strong arms all the time not just in the summer.